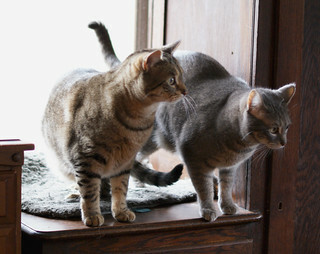 My babies are two today! It seems like just yesterday they were tiny and cute. Now they’re large and gorgeous. 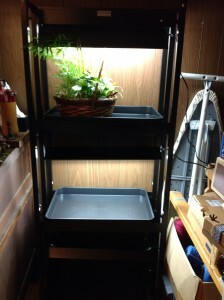 Posted in: garden, Must be spring, pets. Hi April! Welcome to town, lovely to see you again. Oh, yeah, March, the door is that way. Don’t let it hit you on the way out. April, my dear friend! I missed you! Look, I got you flowers! Or maybe you got me flowers. It’s so hard to tell. 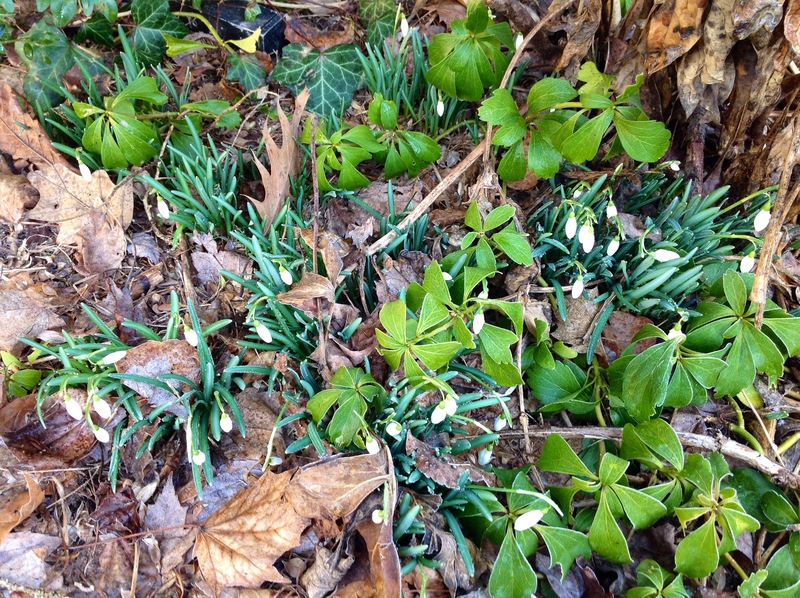 It’s all good, and thanks for melting that snow from yesterday. March was being such a pain. I’m working on some flowers for your friend May. I’ll share them with you too, if you’re nice enough. Not the tomatoes, though, or the peppers. You’re wonderful, but a bit too fickle for those sensitive types. I’ve definitely got some peas for you, and lettuce. Spinach too, just as soon as you warm up a tiny bit more. 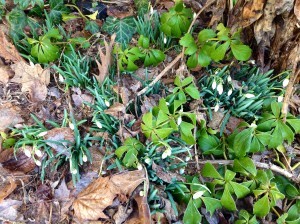 I saw you were still considering snow; I blame March’s bad influence. I know you’re stronger than that: don’t listen! Anyway, I’m glad to see you. Really, really glad. I hope you’re settling in well. Let’s get together soon for drinks, maybe some food, and definitely more flowers. I see those daffodil shoots you’ve got hiding over there, you know. Looking forward to them. 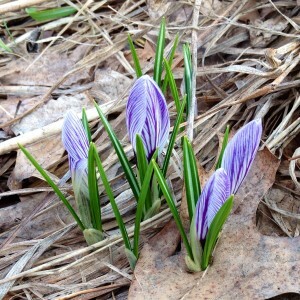 Posted in: Must be spring. Indoor springtime! I decided I wanted to start seeds successfully this year, and after investigating all the options, I decided to purchase the fancy shelf unit from Gardener’s Supply. I went kind of crazy ordering seeds during a snowstorm (there’s no way I can fit seven kinds of heirloom tomatoes into my three raised beds, but so pretty). I finally got the shelves put together. They are very sturdy, and went together nicely. There is light! 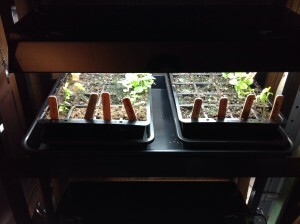 It’s too early to start tomatoes, but maybe some herbs or flowers? 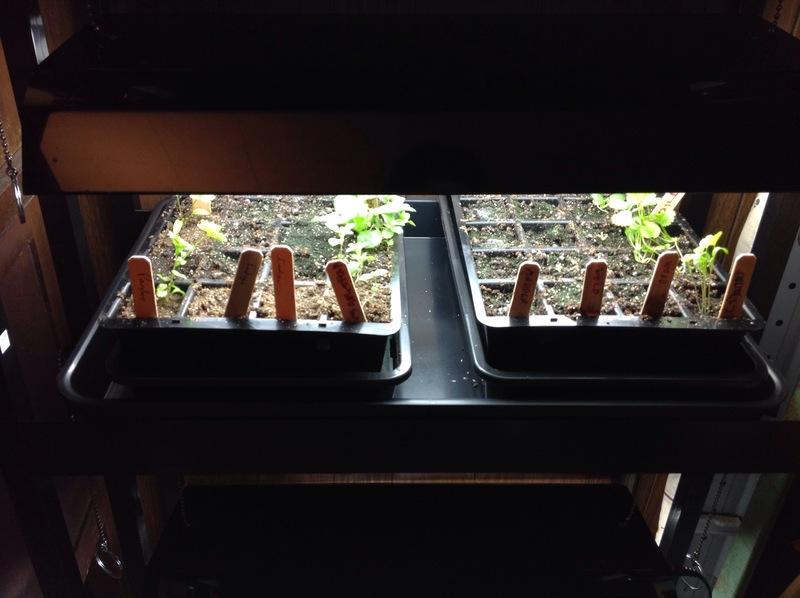 I need to sort through the seeds and see what I can start when. It helps to distract me from the bitter, bitter cold. The cold has been less trouble than it might have been, because a Lovely Friend (who may choose whether or not to take credit) sent us beautiful and comforting knitwear. Aren’t these Laurel mitts just lovely? I’ve been wearing them just about nonstop for the past few days. Lovely Friend also sent something for Thorvaaldr, who is just as enthusiastic but has spent fewer hours wearing his present. I’ve been knitting myself, on more things to dress Eugene rather than anything fancy or elaborate. Still, pretty and warm. The article about us dressing Eugene was passed on to the sculptor and the donors, and all were thrilled. Such fun! And a good thing as well. Interweave has a bunch of stuff on sale for President’s Day, including the Weaver’s Inkle Pattern Directory at $5. I’ve had an e-copy for a while (weaving patterns on the iPad; very convenient), but jumped at the chance to complement it with a physical copy. I bought two; one will show up in the FFF silent auction, I expect. In the distant future: I just submitted four class proposals for the PA Fiber ArtsFest in September. I taught at the first one two years ago, and was on the schedule for last year but had to cancel for health reasons. I hope they let me come back; I haven’t been teaching nearly enough. That last is a new one. I’ve written about it here before but not taught it hands-on. But I just got the wonderful new book Norwegian Pick-up Bandweaving by Heather Torgenrud, and it has reignited my enthusiasm for that particular textile technique, including my desire to do it with the least possible equipment. See, everything you really need to weave these bands is available at an office supply store: a box of unsharpened pencils, a package of rubber bands, a ball of twine, and two bulldog clips. I’m still working on the best low-equipment warping method, but I have time to figure that out. I’ve started a new Flickr album for band photos, though there isn’t much there yet. One of my great enthusiasms is getting people interested in weaving without forcing them to purchase complicated expensive equipment. Another is the way skill of hands and equipment complexity can be interchanged. And look: they overlap right here, in pick-up band weaving. Perfect! This has been languishing in my to-post pile, but that’s unhelpful, because you all NEED TO KNOW (no, really) that many of Penelope Walton Roger’s books on Viking, Anglo-Viking and Anglo-Saxon textiles are available free online, including the one that is so hard to find that even I din’t have a copy. 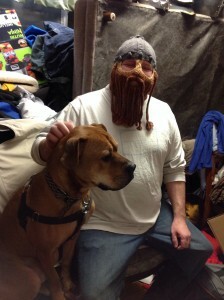 Posted in: New toys, Vikings, weaving. I have an enormous backlog of links and neat things, but wanted to get a couple of them out quickly. The knitting group I’ve been a member of for some years has been engaged in a charity yarn-bombing project, and this has been noticed. Fun! I’m taking a free online course thru Stanford University called “Digging Deeper: Making Manuscripts.” It’s on week three, but you can still sign up. I just did, and blew through the first three weeks in an afternoon. Fascinating stuff! I haven’t hit much new to me yet, but I like getting to hear and see the experts talk about and handle the books. 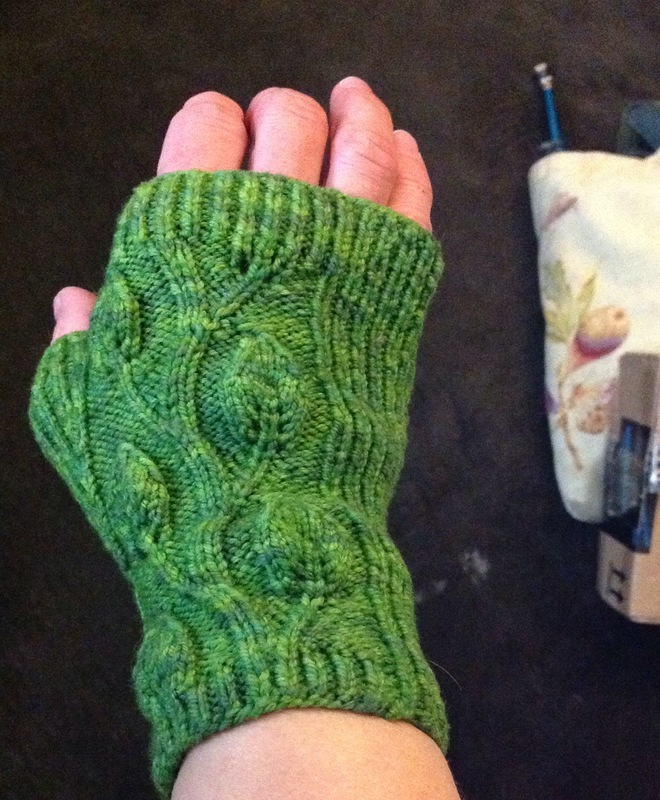 Posted in: Doing stuff, knitting, Medieval, People doing cool things. 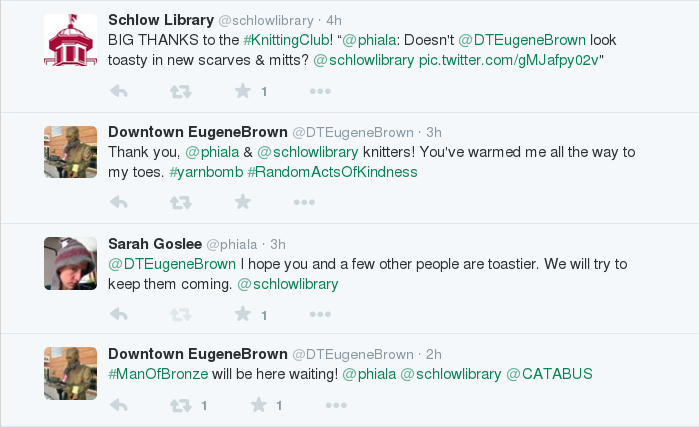 I’ve belonged to the knitting group at Schlow Public Library since its formation five or six years ago. 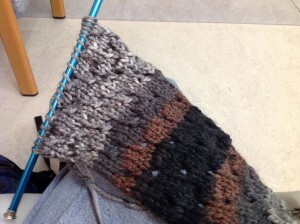 We’ve always done a little bit of knit/crochet to give away – afgans, mostly, and some of our members do other things. This winter I proposed yarn-bombing Downtown Eugene Brown, the statue outside the library and the CATA bus office, and the crocheting Sarah quickly chimed in with an even better idea: charity yarn-bombing! 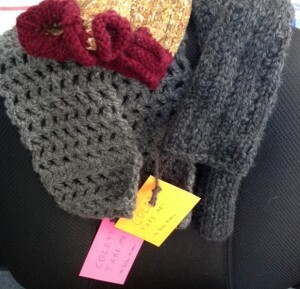 We’re knitting cold-weather gear and dressing Eugene with scarves and such bearing tags that say “Cold? Take me! 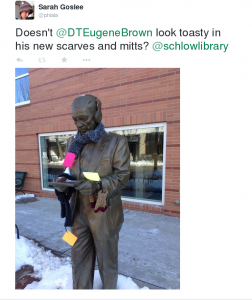 – the Schlow Knitters.” The first scarf went to someone who even thanked the library for it, and I took another batch down today. A lot of the chitchat about this project has taken place on twitter (where else can you talk to a library and a statue about warm woolies? ), so let me share with you today’s conversation. 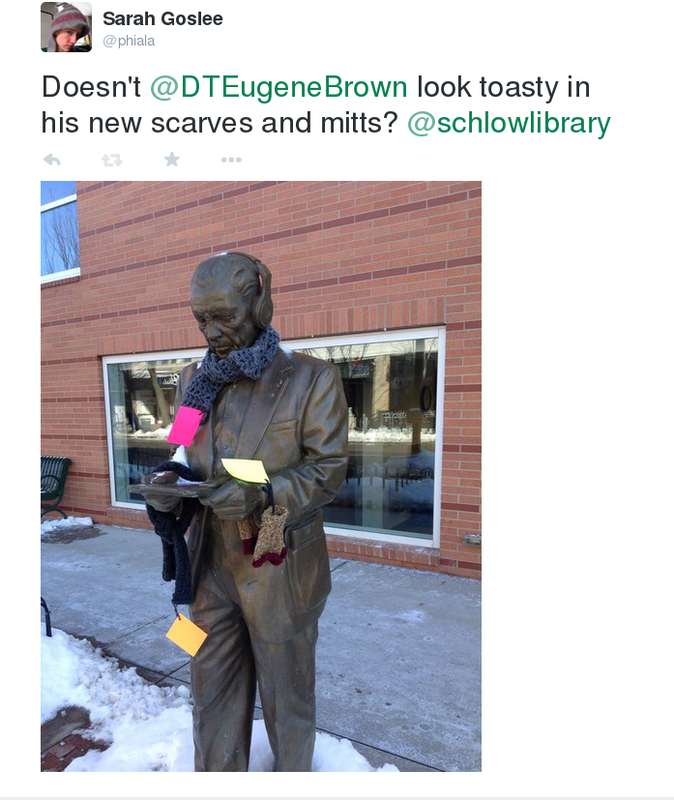 @schlowlibrary: BIG THANKS to the #KnittingClub! So much fun! There are more things on the way; I’ll keep a tally (so far 3 scarves and a pair of mitts) and keep you posted. Eugene is standing at one of the main bus transfer points, waiting for a bus. This is not only next to Schlow Library, but in front of the main CATA office. Not only have we gotten a nice thank-you email from the CATA PR manager, they also popped up on twitter. 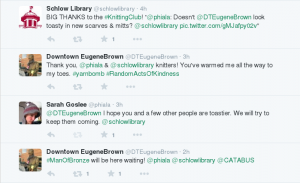 @CATABUS: Thank you, @phiala & @schlowlibrary Knitters, for your kindness! You are absolutely wonderful! Posted in: knitting, Mood enhancers, Winter weather. Goodnight to the sleeping king, laid alone. Wondrous workmanship, wrecked by the Fates. 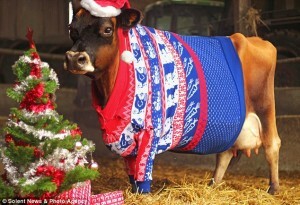 A cow in a Christmas sweater! Gloria was decked out for a charity fundraiser. There’s an interview there with the knitter responsible. Posted in: knitting, Medieval, Mood enhancers. I told her I love textiles, I wish more people did, and wish more people understood what makes a good textile, what makes good technique, and in support of that, I am willing to share what I know. I know a very small portion of the textile world, but I know my part very well! It’s likely what keeps me writing this blog, that desire to expand our base of spinners, dyers and weavers. That, and the wonderful feedback I get from readers! Yes! And for me, the desire to learn new things and share my knowledge. I try to always be coming up with new ways to teach, and new ideas to cover. FFF was a few weeks ago, and as I often do, I tried out something new and experimental: how to analyze and chart a tablet-woven band from an already-woven band or from a photo. Some of that process is intuition and experience, and some of it follows a systematic process that can be taught. At least, my students seemed to get the idea. I’m also disturbingly happy to teach a class on something I don’t know that well, because I’m confident in my ability to figure it out beforehand, and to keep ahead with my students, and in my general teaching skills. (I probably shouldn’t admit this, should I.) You want a three-day class on something I haven’t done in four or five years? No problem! But that gets more knowledge out there, more textile goodness, more people who’ve at least tried these obscure techniques. My great joy, you all know, is obscure fiber arts that use minimal equipment. Tablet weaving is sort of vaguely well-known, and ply-split is becoming more available, but there’s very little on sprang beyond what Carol James is doing, and some of the other odd techniques are mostly in technical publications rather than popular ones (fingerloop braiding, fr’ex). Teaching is how the knowledge and the enthusiasm are spread, that hands-on face-to-face transmission of fiber arts. If you think about it, we’re carrying on something that’s been happening for millenia in not too different a fashion. Our skills aren’t the necessity they once were (but just you wait until after the apocalyptic crash of civilization! ), but they still satisfy some need for many of us. The gathering to learn and to teach is part of that satisfaction. Though if I had the time, I’d be writing popular books on everything Peter Collingwood ever wrote about, except rug weaving.